Still have plenty of pups ready for their new homes right now!! However, if you are waiting to give a pup as a Christmas gift, I have pictures listed on the links to the right as to what new pups will be available for Christmas delivery. We have a whole bunch . . . I am sure some of you are wondering how I can have so many breeds available and do I breed all of them. I breed Chihuahuas and Yorkies and we are very excited to learn that we will be expecting our first litter of French Bulldogs in January. I have two cousins and a sister who also breed. We share pups with each other and that way we can have a large variety of breeds. I get most of the pups to sell as they don't care for that portion of the business. They prefer the raising of the pups. Sooooo, how does this Christmas thing work. I am already making waiting lists for these breeds. 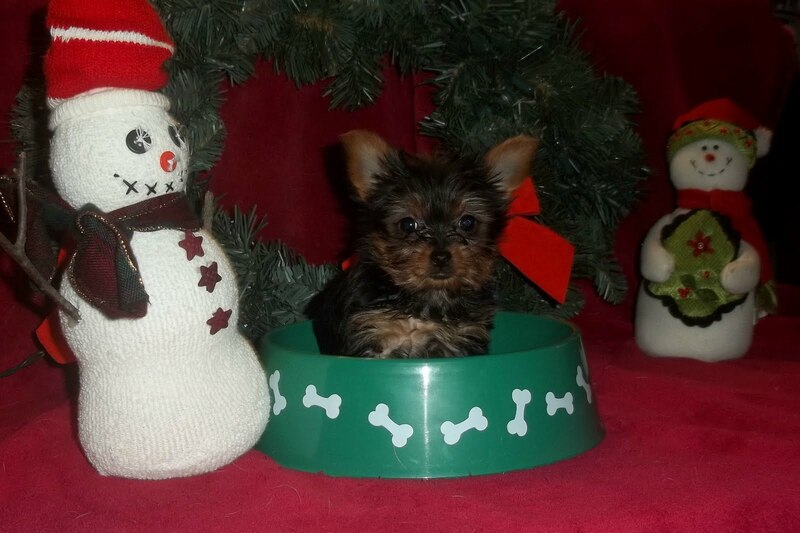 Starting Friday, December 16, I am making appointments to see the new pups. What does this mean? It means that if you are interested in a particular litter, you will get the opportunity to see the pups before anyone else. It does not obligate you to take a pup, it just gives you the option to have one in the litter as my litters sell out pretty quickly, especially in December. If you are not ready to take your pup home until Christmas, I can hold the pup for you for an additional charge of $25.00 and a 50% deposit. You can pick the pup up anytime Christmas Eve or until 9:30 am on Christmas Day. Therefore, if you are interested in something, make sure you give me a call and get on my waiting list. A couple of the waiting lists on particular litters are just about full. Getting a bunch of calls on these new pups, so if you see something you are interested in, please give us a call. I hate when people are disappointed when they are gone. This is a great time for a pup as it is far enough away from Christmas that they have an adjustment period before all of the festivities. However, if you really want a Christmas pup (I totally understand, when my kids were little-I wanted Santa to deliver their pup), I will have a bunch of pups available. Feel free to give me a call and get on the waiting lists, some of the litters are already spoken for. What does being on the waiting list entail? It means that you will get a chance to see the pups before they are offered through the paper. It doesn't mean you are obligated to take a pup, I want you to meet them and make sure it is a good match for you and your family, before a final decision is made. So, if you are not ready to take one of the pups that is ready at this time and have something else in mind, do not hesitate to give us a call. Thanks to my daughter Katie, we were able to get every pup photographed. I have added some new pics to the links and will be adding some more tomorrow. They are beautiful pups, just waiting for you to come and meet them. Give us a call. A big thank you to everyone who took home a puppy over the weekend. All of the new puppies will be available to be shown and go home this Saturday, November 12. I am making appts. as we speak. I will post pics of all of the pups in the next few days. So far, I have pics of the Maltipoos, Teddy Bears, Schnoodles and Shih Poos. Click on each link to get more info on each litter. Need to start making room for the new litters of pups that will be available next weekend, November 12. Therefore, all the pups that are available right now have been discounted. A great deal on great pups. They are about 10-11 weeks old. This is truly the best time to start potty training. We are available all weekend to show any of the pups available. Check the links for availablility and price reductions and give us a call!